Chaya Rivkah Jessel, a”h, was born in Johannesburg in 1965/5725, and later moved to Sydney , Australia . An idealist with a passion for learning, she attended university and became an expert in feminist theory and practice, while immersing herself in women's struggles. Providentially, she also became acquainted with Orthodox Jews for the first time in her life, and soon realized that the Torah – including its deep understanding of women – could not be easily dismissed. She appreciated the Torah's well-developed, enduring concept of the feminine and she gradually took on religious observance. She returned to Johannesburg to visit her family and while there, began attending the popular shiurim of Rabbi Akiva Tatz. She would emerge from these shiurim shaking, and would have to wait until she had calmed down to be able to drive home. 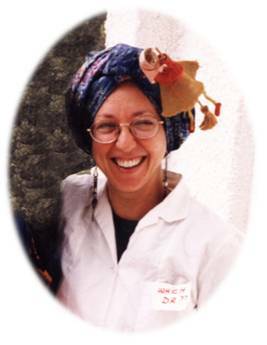 Seeing the seriousness of her questions and her drive for understanding, Rabbi Tatz sent her to Neve Yerushalayim College for Women in Jerusalem . There she met her future husband, Shlomo Zalman Jessel. They moved to her husband's native Toronto , where Chaya Rivkah began speaking to groups of Beis Yaakov women about her ongoing journey through feminism to Judaism. Thus began her career of using her inside knowledge of the feminist movement to bring others closer to Yiddishkeit. After two years, she returned to Eretz Yisrael with her growing family, settling on Moshav Matityahu, adjacent to Kiryat Sefer. She began to write articles for Jewish publications, while availing herself of the wealth of Torah scholars in Israel to continue her quest to understand and embody the Torah view of women. She received particular encouragement from Rabbi Yitzchak Berkovitz, shlita, Rabbi Nachman Bulman, a”h, and Rabbi Mordecai Shakovitzky, a”h. Eventually, she embarked on her most ambitious project. Putting her extensive research skills to use, she administered structured interviews to women who had formerly been very involved in the women's movement, but who, like her, had now become uncompromisingly loyal to Torah and halacha. Their responses formed the basis of a new book, which was aimed at the well-educated secular woman. She considered it vital to describe the woman's role in Judaism in ways that would neither be condescending nor apologetic. Nevertheless, the fact that this book is still unfinished stands testimony to the importance she ascribed to her role as a Jewish mother. For her, family always came first. An extremely conscientious mother, she invested tremendous creative energy into training and positively motivating her children. Even in the face of serious challenges and setbacks, she faced the obstacles as she faced all of life, with strength, courage and conviction. A pillar of integrity, Chaya Rivkah pursued emes in interpersonal relationships just as she did in her writings. She went to great lengths to return borrowed objects promptly, and when she dispensed charity and kindness it was always with an eye toward identifying the particular personality and needs of the recipient. As her sensitivity to others deepened, she would seek forgiveness and make amends, even when she found it very difficult to do so, and even if she had had no contact with the other person in years. Gentle, tactful, and nurturing, she reclaimed those very feminine qualities that the secular world derides. Her courage, strength tempered with sensitivity, profound intellectual insight, keen aesthetic sense, vitality and a walloping sense of humor (that had women in stitches on a regular basis) -- all were mobilized towards the service of Hashem. When she was diagnosed four months ago with a serious illness, she dealt with it in an exemplary way. Though weak, she embarked on an additional program of tefillah and study, concentrating on shemiras haloshan and enhancing simcha . In his eulogy, Rabbi Shmuel Nussbaum, Rosh Kollel at Shaarei Shlomo in Kiryat Sefer, testified that she accepted her suffering with love. All she wanted to know was how best to use it. Chaya Rivkah was a woman of indomitable spirit with a true joie de vivre . Her husband in his eulogy spoke of how she appreciated the simplest things – a fresh blossom, rain, even the feel of the wind on her face as she hung the laundry. She had a genuine smile, an easy laugh, and a natural sense of propriety. She worked on herself constantly and sought out things that would inspire her and bring her closer to Hashem. Rabbi Zev Leff, Morah D'Asra of Matisyahu, said in his eulogy that she was a good friend, who cared for people and made them want to smile and laugh a little bit. She had an ayin yafe, and saw the good in everyone and in very situation and she brought out the best in everybody. Rabbi Leff also emphasized the importance of finding the funds to enable her monumental book to be completed and published. Chaya Rivkah leaves many, many devoted friends, for she was so genuinely caring, so instinctively capable of seeing and bringing out the good in people, that just one conversation with her was enough to cement a friendship. On hearing of her parting even the nurses cried. She will be sorely missed. Chaya Rivkah leaves a mother, a brother, a husband and four young children. Letters and donations can be sent care of Cheryl Auerbach, Moshav Matityahu, Israel , 972-8-9144755, or Jessel@softhome.net .